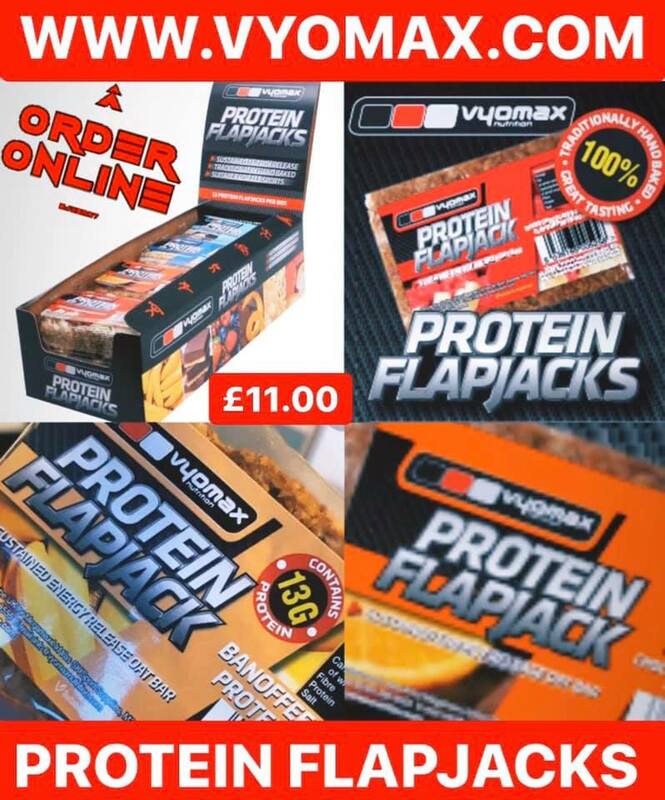 The original, traditionally hand baked, Vyomax® Protein flapjacks, available in 12 delicious flavours. Vyomax® High Protein Flapjacks are ideal to be eaten as a pre-workout or recovery food. They have been specifically formulated to provide you with the necessary protein and carbohydrates for before or after a strenuous workout, they can also be used as a supplement to boost your calorie intake and help your bulking phase. Perfect as a snack for everyone whilst on the go too! Wholegrain OATS (32%), Kibbled SOYA (20%), All Vegetable Margarine (RSPO, Rapeseed Oil, Salt, Emulsifier: Polyglycerol Esters of Fatty Acids, Flavouring), Syrup, Sugar, Chocolate Flavoured Coating (6%) (Sugar, Palm Oil, Whey Powder (MILK), Fat Reduced Cocoa Powder, Emulsifier SOYA Lecithin, Flavouring), Whey Protein (MILK) (2%), Flavouring (SULPHITE). For Allergens, including cereals containing gluten, see ingredients in BOLD, CAPITALS. Wholegrain OATS (32%), Kibbled SOYA (20%), All Vegetable Margarine (RSPO, Rapeseed Oil, Salt, Emulsifier: Polyglycerol Esters of Fatty Acids, Flavouring), Syrup, Sugar, White Chocolate Flavoured Coating (4%) (Sugar, Palm Oil, Whey Powder (MILK), Emulsifier SOYA Lecithin, Flavouring), Mixed Fruit Jam (3%) (Glucose Syrup, Sugar, Apple Puree, Plum Puree, Apricot Puree, Colour Anthocyanin, Acidity Regulator: Trisodium Citratem, Gelling Agent: Pectin, Acidity Regulator: Citric Acid, Natural Flavour), Whey Protein (MILK) (2%), Flavouring (SULPHITE). For Allergens, including cereals containing gluten, see ingredients in BOLD, CAPITALS. 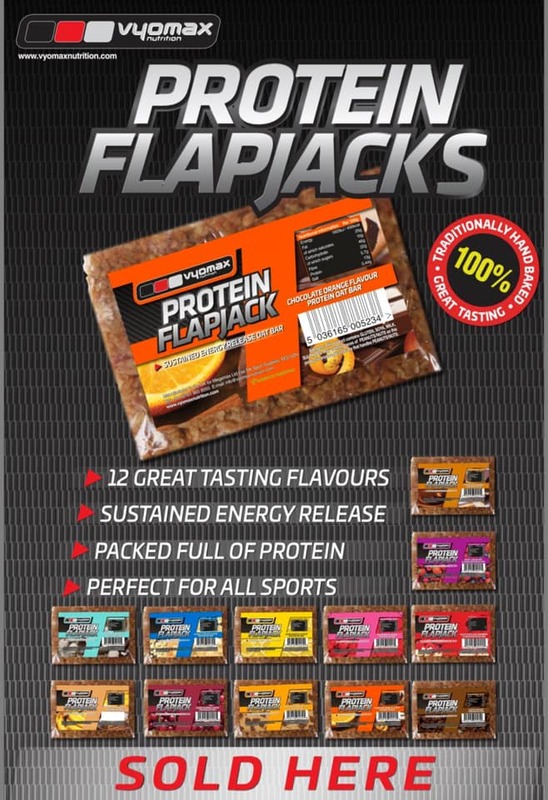 All the flavours of flapjacks may contain nut traces as all the products are manufactured in a premises that handles nuts.